The base of skull, also known as the cranial base or the cranial floor, is the most inferior area of the skull. It is composed of the endocranium and the lower parts of the skull roof. Base of the skull, inferior or outer surface. Showing various muscle attachments. Base of the skull. Inferior surface, attachment of muscles marked in red. The foramina in the base of the skull are exit and entry-points for veins, arteries and cranial nerves. The cranial nerves as they exit through various foramina. 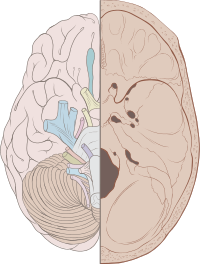 Wikimedia Commons has media related to Cranial base.